He is the Mr. October of the Midwest. The name is David Freese. And no one takes over the postseason and sends teams packing for the winter like this dude. The Cardinals are the Cardinals, which is to say they are successfully boring and boringly successful. The Dodgers wear gold; the Cardinals invest in it. The Dodgers go out in Hollywood; the Cardinals watch movies made there. The Dodgers are daring; the Cardinals ooze comfort. These are not regional stereotypes. Each franchise happens to typify where it is located. Just watch Friday, when they meet here in Game 1 of the National League Championship Series. The Dodgers will send to the mound Zack Greinke, their $147 million free-agent treasure. The Cardinals will counter with Joe Kelly or Shelby Miller, a pair of homegrown kids who make a combined $983,000 this season. The Pirates had the great story, the magical season in which they broke a record 20-year string of losing seasons, and the crazy-loud beautiful ballpark that finally came alive. The Cardinals didn't begrudge them that, and they didn't complain about the attention that the Pirates got. 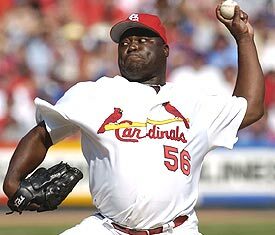 As a Cardinals fan, I'm aware of the long history of fat Cardinals. We have employed a list of them fromBob Horner to Terry Pendleton to Ray King, my personal favorite. (King always looked like he was justabout to pop, exploding burrito refuse in all directions.) But Adams' homer is without question the greatest Fat Cardinal Moment in team history. It's going to be difficult to top it. We’re spoiled, really. Watching postseason baseball and experiencing the thrills and the triumphs of October is no longer a privilege in St. Louis. It is a way of life, a part of the cityscape, and a cherished tradition that rarely fails to raise spirits and cause hearts to flutter. This is St. Louis, the best baseball town in America. This is the home of the Cardinals, an iconic franchise that stands above most others that have occupied a place in our national pastime. In contradiction, St. Louis epitomizes American virtue. The organization is laced with tradition, from the unchanging uniform to the Busch name that has been bequeathed from one stadium to another and will always be synonymous with Cardinals baseball. The Midwestern franchise even borrowed techniques from the region’s farmlands to cultivate success. Branch Rickey planted crops, or in this case young ballplayers, across the country to better develop talent. We are a nation, in many ways, born on the farm. So, too, are the Cardinals.